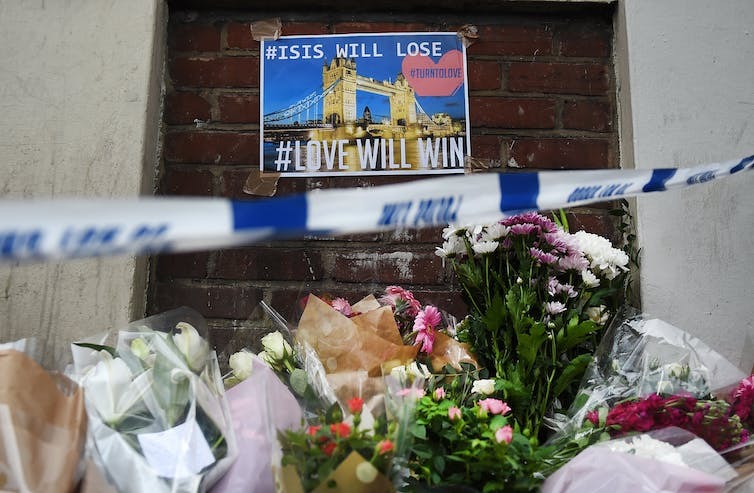 Floral tributes near an an anti-Islamic State poster near Borough market, London. Legitimate questions certainly arise from the weekend outrage in London, but they are not those immediately provoked by Pauline Hanson or Donald Trump. The capitals presumably mean either that he was shouting or that he really means it. Not so the One Nation leader, who chose to use Twitter to desecrate the warning from the British authorities for people to “run, hide and tell” by declaring that it was time to “stop Islamic immigration before it is too late”. Labor’s Penny Wong rightly declared Hanson’s eructation “irresponsible and crass”. One of Australia’s foremost counter-terrorism experts, Greg Barton of Deakin University, went further, telling me that what the One Nation leader was saying was “downright dangerous” on at least two counts. One, in this age of postmodern terrorism, Islamic State operates as the first metaphysical nation with no dependence on physical territory or traditional communication to wield its power. In that environment, the security authorities rely on tips from the communities from which impressionable operatives emerge. Maligning those very communities, Barton says, tends to make its members turn inward, reducing their trust in the authorities and diminishing the likelihood that they will report the wayward behaviour of people they know. Witness the bizarre spectacle of the Manchester bomber, Salman Abedi, praying loudly in the street. Second, it encourages the very sense of alienation, the feeling that they are stigmatised outsiders, that leads people to lose their sense of belonging. That makes them more vulnerable to the brutal siren call of murderous extremists. Hanson either does not know this or does not care, because it is likely that her anti-Muslim message, basically a reworking of her initial hostility to Aborigines and then to Asians, appeals to much of One Nation’s base. What more would you expect from a person who over two decades has used the public purse to turn politics into a highly successful small business? There are legitimate questions, though, about this latest attack in the UK, the third in as many months. One is whether Britain has a peculiar problem when it comes to these apparently autonomous acts of ghastly violence. The other is whether the London Bridge/Borough Market attack had anything to do with the UK election, now only days away. The answer to the latter is probably not. As Barton points out, if the perpetrators had wanted to influence voters, they or their sponsors would have made a statement to that effect in some form, either direct or allusive. That is not to say that the violence of Saturday night won’t affect the result of Thursday’s poll. Conventional analysis has it that assaults on security tend to favour the incumbent, especially if they are from the centre right. Theresa May’s Tories consistently poll as “better for” national security than Jeremy Corbyn’s Labour Party. But this has not been a conventional UK election campaign and there are also questions about whether a sense may take root within the electorate that the government is failing to protect the community, following two fatal acts of terrorism in just a fortnight – Manchester and now London. May was, after all, home secretary, responsible for domestic security, for six years before she became prime minister. She has not had a good election. Gone are the days, less than two months ago, when it looked as if she could gain a majority of 100 in the House of Commons, knocking Corbyn for six. Her refusal to engage with Corbyn was seen as arrogant, and UK voters are sick of going to the polls (three times in less than two years). There was also her blunder on a “dementia” tax, essentially a proposal to make the elderly contribute to their health care if they have combined assets of more than £100,000. Immediate public outcry forced a U-turn, but the damage had been done. As campaign managers would say, May had gone “off-message”. The election was no longer a plebiscite on her managing of Brexit, but an argument about health and welfare, traditional Labour turf. It was a surprising mistake, especially given that as a political up-and-comer May warned the Conservatives back in 2002 that it had become the “nasty party”. Its base was “too narrow” and on occasion so were its sympathies, a sermon this child of the manse had clearly forgotten delivering. Many … professionals in our intelligence and security services have pointed to the connections between wars our government has supported … and terrorism here at home. I have been here with the G7, working with other international leaders to fight terrorism. At the same time, Jeremy Corbyn has said that terror attacks in Britain are our own fault. Corbyn was “not up to the job”, she said. He also faced criticism from within his own ranks, but it seems May’s decision to play the security card was not as effective as she might have hoped, because the opinion polls continued to tighten in Labour’s favour. None of this means May will lose when the votes come in on Thursday. Rather, it shows that national security is a more complex issue in the UK these days, after a decade and a half of unpopular wars and years punctuated by regular, fatal terrorist attacks. It is not clear whether the story is the same in either the United States or Australia. It is possible this is one way the UK is grimly unique. This entry was posted in England, ISIL - Islamic State in Iraq and the Levant, Islam, news, Politics, United Kingdom and tagged article, attack, election, England, Is, ISIL, Isis, Islam, Islamic State, Islamic State in Iraq and the Levant, leaders, London, London Bridge, Manchester, Muslim, muslims, news, political, Politics, terror, terrorist, United Kingdom. Bookmark the permalink. ← Why is it so difficult to prosecute returning fighters?